I always loved Github’s ability to publish pages for a project and get the strain out of your server. However, every time I tried it, I struggled to keep the gh-pages branch up to date. Until I discovered the awesome git rebase. I know this is old news to some of you (I’m a github n00b, struggling with basic stuff, so my advice is probably for other n00bs), but if I had read this a few months ago, it would’ve saved me big hassles, so I’m writing it for the others out there that are like me a few months ago. I wrote this script while at the airport travelling to Oslo and during the Frontend 2011 conference. 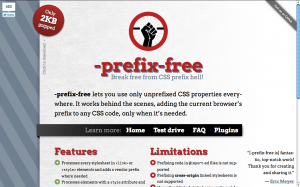 I think it’s amazing, and it makes authoring CSS3 a pleasure. Read my announcement about it on Smashing Magazine. A week ago, I released Chainvas. It was a spin-off script I wrote while developing my cubic-bezier tool, to make using the Canvas API a bit less painful. 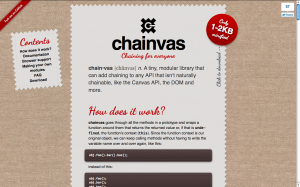 However, unlike similar attempts to make the Canvas API chainable, most of my code was written in a very generic manner, and was actually able to make every API chainable. However, when I released it, even though I mentioned that it can be used for other APIs and provided some examples, practically everyone that shared the link on twitter or other means (thank you .net magazine for the newsletter mention btw!) focused on what Chainvas did for Canvas. Actually, while using Chainvas myself, I found it immensely more useful for chaining DOM methods and setting multiple element properties at once. Chainvas had a lot of potential, that most people were missing. And then it dawned on me: I should modularize the library! A generic chaining library at its core and additional modules for making the different APIs chainable. And I did it. On the way to that, I added IE8 compatibility, and tested in many other browsers, thanks to Browserstack. I actually found that Chainvas’ core even works in IE6! I also wrote unit tests, a much more extensive documentation, added a script generated table of contents and designed a logo and a Chainvas pride banner. 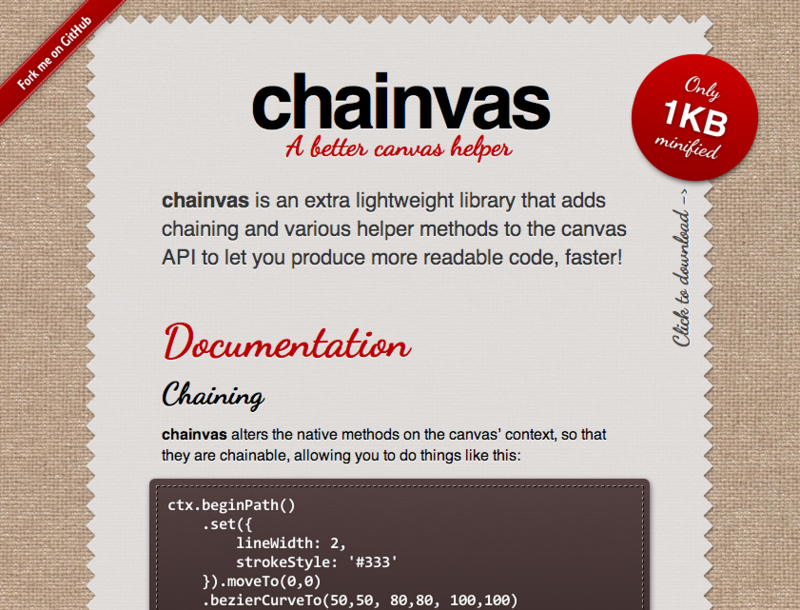 Every module is included in chainvas.js and chainvas.min.js, along with a header comment that follows a specific syntax. The user selects a compression level and then, the relevant script is downloaded through XHR and split into parts according to the module headers. Then a module list is generated with checkboxes for the user to select the ones they want to include. When the user checks and unchecks those checkboxes, the URL of the download link changes to a data URI that contains the script. This approach has the disadvantage that there is no default filename, and the “Save page as…” link is deactivated in Chrome (why Chrome??). However, I like the idea so much, I don’t mind these shortcomings. That’s about it. Enjoy and let me know about any bugs. A few days ago, I had a talk at a conference in Zurich (I’m going to write more about it in another post). 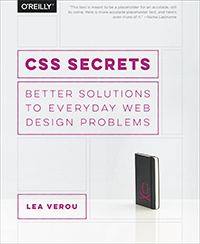 The talk was about “10 things you might not know about CSS3”. The first of those things was how you can do bouncing transitions with cubic-bezier() instead of an easing keyword. As usual, my slides included a few live demos of the functionality, in which I edited the cubic-bezier() parameters and the audience could see the transition produced. 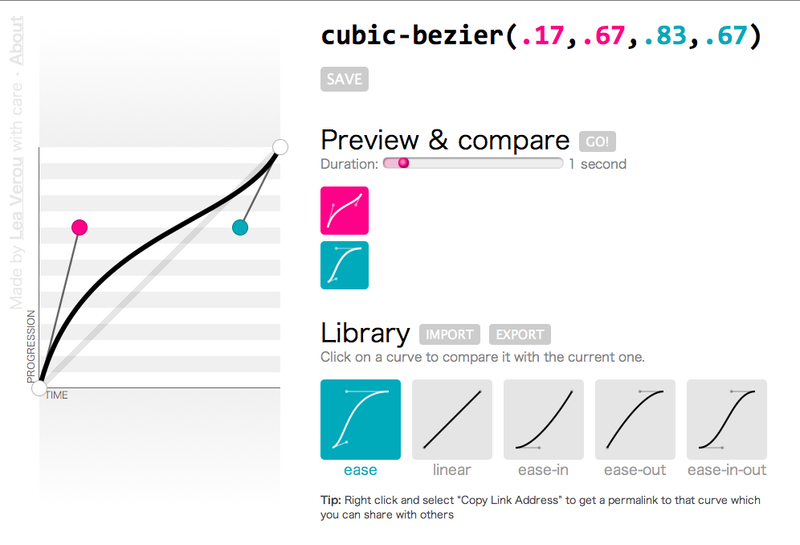 However, in the case of cubic-bezier() that’s not enough. No matter how much you see someone changing the parameters, if you don’t picture it in a 2D plane, it’s very hard to understand how it works. So, the night before, I searched for a tool I could use to show them how bezier curves are formed. I found plenty, but all of them restricted the the coordinates to the 0-1 range. I’m not sure if the cause is ignorance about the spec changes or that Webkit hasn’t caught up with those changes yet (but it will, soon). The only one that supported values out of range was this one from the Opera Dragonfly developers, but I found it kinda impossible to adapt. For my talk, I tried to adapt one of them but it was late so I gave up after a while and ended up just showing them a screenshot. And the day after the talk, I started adapting this to my needs (ever tried coding at a conference? It’s awesome, you get to ask questions from very knowledgeable people and ger replies straight away). And then I started cleaning up the code, changing how it worked, adding features. At this point, I think the only thing that’s left from that tool is …the HTML5 doctype. 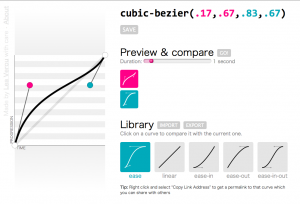 After 3-4 days, I finished it, and got it its own domain, cubic-bezier.com (I was surprised it was still free). So, in a nutshell, what makes this better? 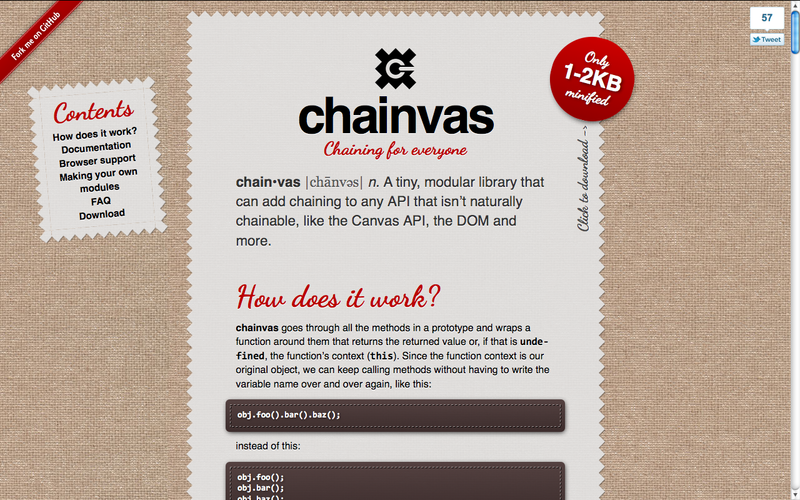 I also used my tiny chaining framework, Chainvas throughout this project. It’s definitely not the first time someone writes a script to make the canvas API chainable, as a quick Google search will confirm. However, I think my attempt has merit, because it’s not really focused in chaining canvas methods, but just about every API you use it on and because it’s super small, only 1KB! Thought I’d let you know that my Smashing Magazine article with that title was published today. It discusses why, how, when and where to report browser bugs, as well as how to make a good bug report. Get comfortable and make a big cup of coffee before you dive in, as it’s quite long (4000 words). As you can see, the number of characters is hardcoded in the steps() function, but that’s the only place. Everything else is totally flexible. Apart from the font: It has to be monospace, so that every character has the same width. If you’re having trouble understanding how it works, take a look at this simpler example, with just the cursor. 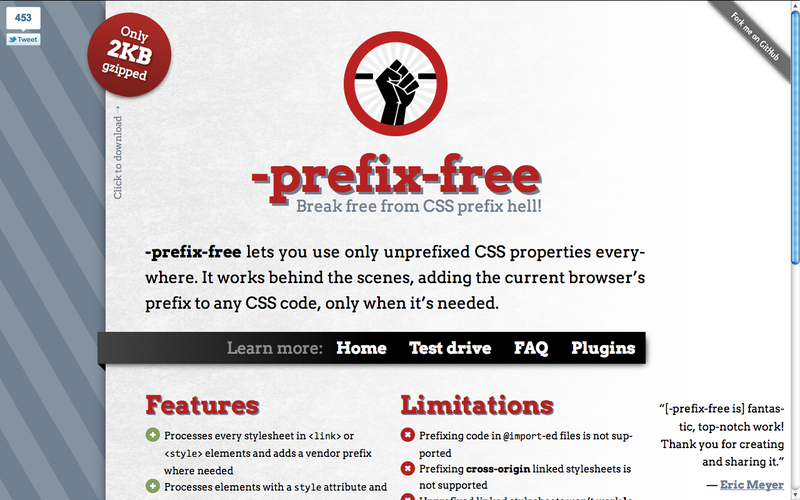 Gecko (Firefox) and Webkit only at the moment, since other engines haven’t implemented CSS animations yet. However, both examples degrade very gracefully in other browsers (IMO at least).